SPB Mobile Shell v3.5 reviewed! This review comes in a bit late, but better late than never. 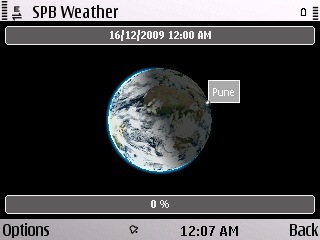 SPB Software is quite a renowned company making apps for various mobile phone OS platforms. 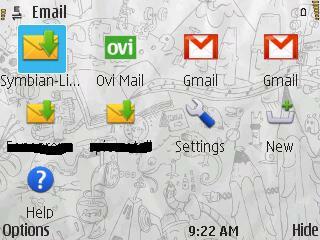 Symbian is one of them. We were lucky to snag a copy of SPB Mobile Shell v3.5 for review. So what is the SPB Mobile Shell? 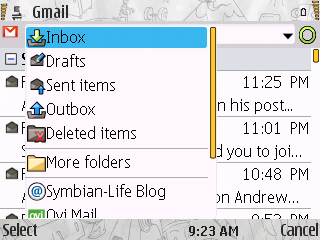 In simple words, without a lot of techno babble, it is a customization and personalization tool for Symbian touchscreen phones. Before I go into great detail let me post a few lead features of this application. So what does it do…. well what it does is makes your drab boring homescreen interesting and alive. 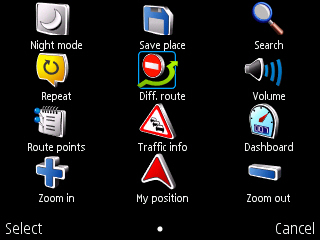 If you have had a touchscreen Symbian for quite sometime, you know what I am talking about. The screen is good, but it just can’t contain all the things you need on one screen or a pane even. I, for example would like to have my homescreen full of icons of apps I use all the time, but I can’t. In such a case I am left hitting the menu button quite often and then browsing for that app and firing it up… phew that’s a lot to describe imagine doing it every now and then! 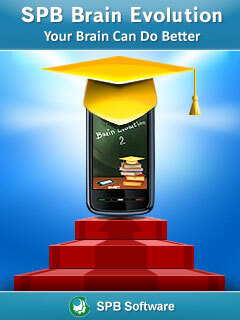 SPB Software, a leading mobile software developer, recently announced that the Symbian version of its famous developmental game SPB Brain Evolution has received a major update and now reached version 2.1. 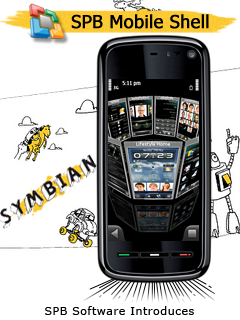 The version for Symbian-based smartphones had been released over a year ago to become a significant selling success for SPB Software. 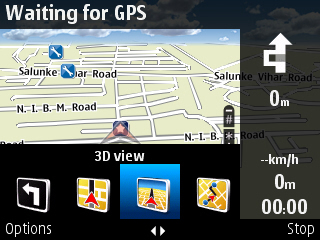 The new version brings support for touchscreen-based devices with OS Symbian S60 v5. 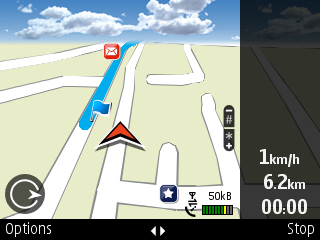 Controls in version 2.1 were reconsidered to ensure seamless, finger-friendly experience. SPB Brain Evolution is a set of addictive mini-games which have to be played in sequence: only good results in a game unlock the next one. The game allows hundreds of thousands of users worldwide to improve their mental awareness and maintain their newly achieved brain fitness. The excercises included in SPB Brain Evolution are Sudoku, Numbers, Arithmetics, Quadronica, Guess Who, Memorica, Encyclopedia, Minesweeper, Matches, Balltracker, Geometry and Pairs, the latter two being new. They help user to exercise such basic mind activities as logic, arithmetic and memory. While the training mode prepares you for the battle the marking mode allows you to register your progress. The game also allows tracking the progress in your personal brain evolution which immediately becomes available in the form of a diagram or a score. SPB Brain Evolution 2.1 for Symbian is compatible with Symbian 9.1, Symbian 9.2, Symbian 9.3 and Symbian 9.5. A free, 15-day trial can be downloaded, or SPB Brain Evolution may be purchased for 14.95 USD from http://www.spb.com. The application can also be purchased from OVI store. You can read more about it and even buy it from here. 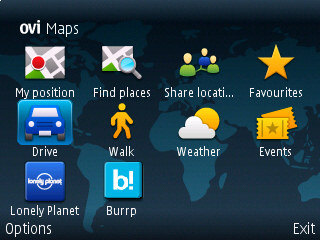 In the concluding part of our review of the Nokia E72 we look at the GPS, Nokia Messaging and Internet features of E72. 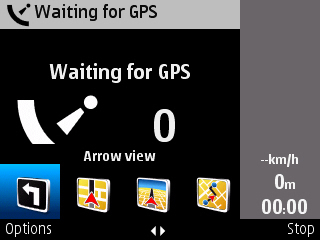 With Ovi maps being upgraded to its current iteration, the E72 has suddenly jumped from being a phone with GPS, to becoming a dedicated GPS device. 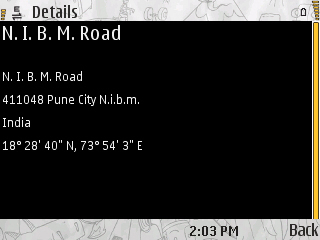 Once Ovi Maps is running, rest assured you can forget that this is a phone. That’s a good thing in my opinion. 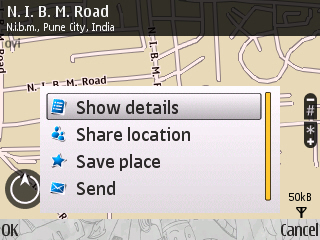 Facebook integration is also a very good touch and extends the boundaries of GPS devices. 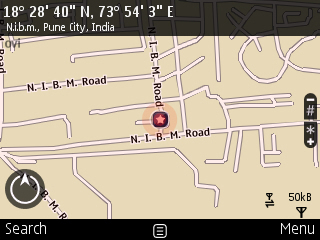 I’ve tried out the GPS extensively in Mumbai (where I am currently staying) and found it to be very accurate. 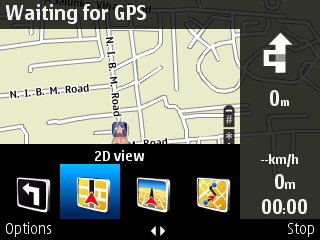 The Driving navigation and walking navigation profiles meant getting lost can be now be considered as just an excuse for exploring. With the inclusion of Lonely Planet and Burrp, finding what to do, where to eat and what to shop is easy as pie. No longer can an outsider be fooled with directions and be left wondering what to do in a new city, so long as he/she has Ovi maps. 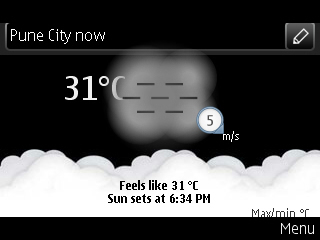 Another feature is the inclusion of knowing the weather of the city you are in. With this, the need for a weather application is not there now. 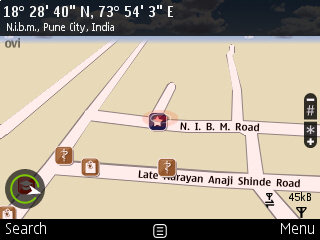 Ovi maps is suddenly an application I use much more than Google Maps even. There is voice navigation while driving or walking for free, one can download the voice packs over the air and even share their location on facebook along with a photograph also. 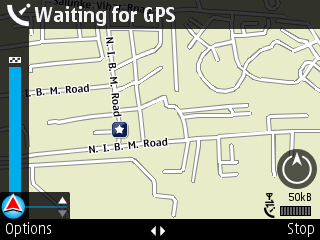 It just seems a matter of time before more services are added to Ovi maps. I’ll give it a 8.5/10. The application worked wonderfully and I love it totally. 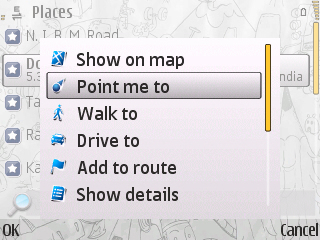 I am withholding a few points with me because Ovi maps is only scratching the surface in terms of functionality. 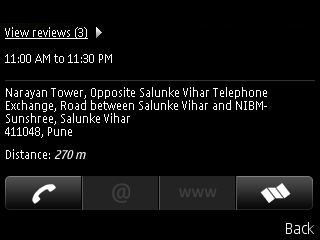 Nokia clearly has much more planned with this service. 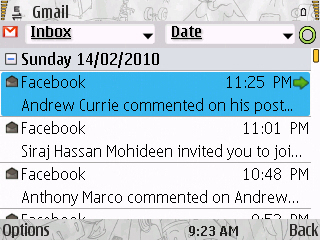 When I first heard of Nokia Messaging coming on the E72 as a built in client I had my reservations and instantly thought that this is the feature that will doom this device. But clearly after having hesitantly trying it out on the E72, I was forced to change my line of thinking. 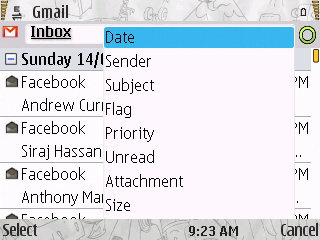 Nokia Messaging for some reason had never worked the way it should have on the trial E75 I had. 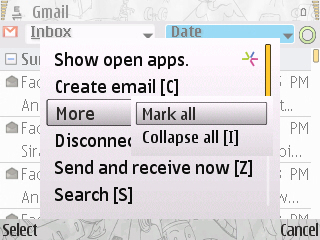 But on the E72, it seems like Nokia Messaging team has worked very hard. It works as advertised, I should say. It does ‘freeze’ at times, but the fix for it equally simple – reboot the device. Things are back to working the way they are supposed to. Overall, I found zero hiccups with the password getting deleted automatically or the service breaking down. My belief in the built in client has been restored. 9/10 for this feature and service. Works just like it is supposed to. 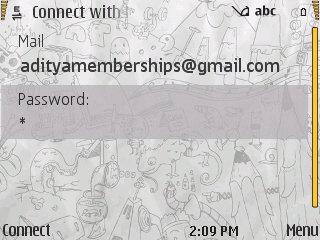 Nokia Messaging totally makes the phone worth buying and using. No review of a smartphone can be complete without a look into the internet capabilities of it. Nokia’s E72 has the same browser all its S60 phones have and I won’t go into details regarding it. What I will however point out is that the pages do get rendered quicker. The rendering speeds, I found were a bit quicker than on earlier devices. Flash integration which has been there for quite sometime now also exists in this device. The web browser is quite frankly speaking a very robust browser and reliable too. What I do find lacking in today’s date is the ability to browse multiple websites simultaneously – tabbed browsing. It’s definitely dated in terms of looks and is lacking the all important tabbed browsing feature, but it’s still a capable performer and can easily compete with the Safaris and Internet Explorers of the mobile world. 7.5/10 is fitting for it. Dated looks and absence of tabbed browsing is badly needed to push this browser into the next level. Here is a gallery full of screenshots of the above three applications. 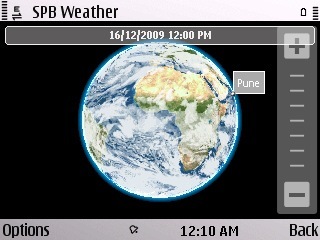 SPB software have just launched SPB weather for Symbian devices on the 15th of December, 2009. It combines detailed forecasts of 10000 cities worldwide with up to date satellite images on a 3D globe and very good UI too. This application is supported on S60 3rd edition (FP1) device onwards to S60 5th edition devices. That means it will work on quite a few old devices as well. 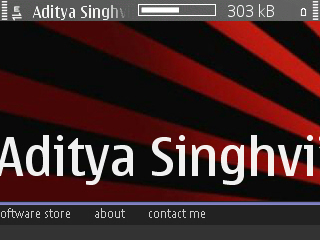 We, at ‘adityasphones’ have had access to the software for review and we did give it a shot. We wanted to see if this application was indeed as good as it claims or not. We found that SPB Weather is a nice little application to have. 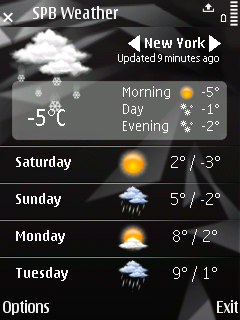 It is indeed better than Accuweather which ships with Nokia devices. The reason being simple, it offers a lot more info than just numbers. All the stated features work like a charm. 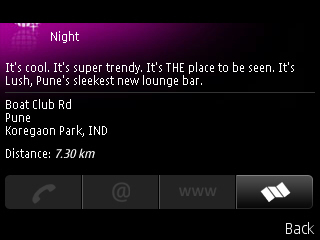 Having tested it on the E72. The UI has very good transitions (just like the ones on SPB TV) and works effortlessly, I never had issues with the application locking or freezing while downloading content. All of this despite the fact that it is a 4.4MB file! 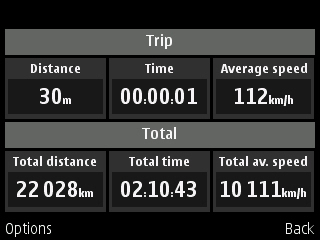 The best part is that this application was able to pull data from the web even on a GPRS connection, forget EDGE and 3G and that too without much effort. 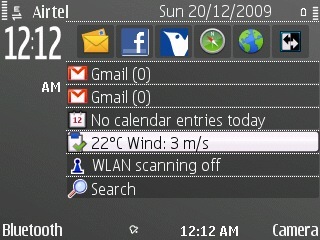 The homescreen widget was pretty good too, it created the widget in the form of a ‘to do’ note on the device. This feature might be liked or disliked by some people, but I thought it was an efficient and nice touch. Selecting a particular day for a chosen city brought up detailed weather forecasts predicted. The forecasts of upto 5 days is available for each city you choose. 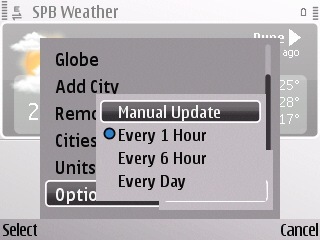 An interesting and very nice touch was the ability to use GPS to find the weather for your area. 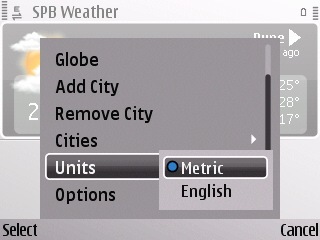 It makes it easier now to search for your city now and check the weather. 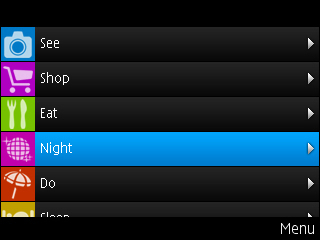 The number of customizations offered is also very nice. Though this app is pretty robust and eats very little resources, we did find a small bug in it. 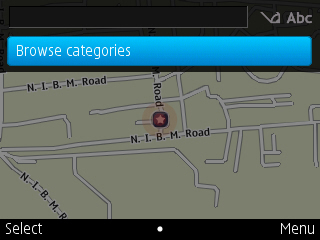 We are not sure if this affects all the devices, but on the E72 we had problems typing location. 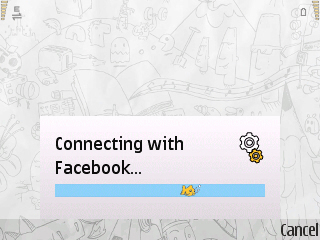 The application it seems has not been properly calibrated for QWERTY devices. This was the only major flaw that we noticed in this otherwise good application. This however can be corrected by SPB and patched also, we have informed them of the same. 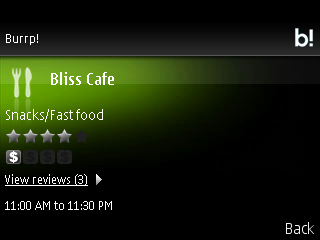 Overall, this is a very good application providing excellent service. It certainly provides a more comprehensive view of the weather. We just hope that QWERTY keypad issue can be corrected quickly. For $14.95 (US) it is a great application. With the Copenhagen round to save the environment going on, it is quite a coincidence that we are reviewing a weather application. 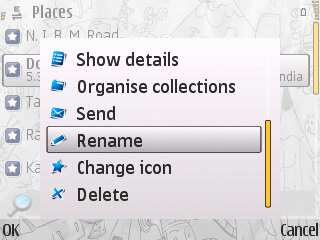 Below, are a huge gallery of screenshots of the above application. About a week back I had a chance to interact with Jackson Feijó from Brazil, he has developed an app that allows disabled users to blow into the microphone of an S60 device to control certain features. There’s an interview with Jackson here http://bit.ly/3KfxBG where he talks about the idea in detail. This was possible courtesy WOM World and Daily App Blog. 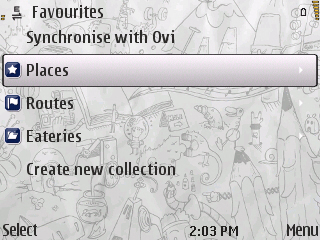 This blog from Ovi features exciting info about Ovi and apps. They even have a contest or two going on where the winner gets to go to New York.